Landed in Calgary Thursday about 9:30pm, grabbed our rental car from Enterprise and plopped on the hotel bed for some much needed sleep. Neither of us were able to sleep, I suppose because we were excited about our new rig. The inspection said it was in great shape, the brakes, rotors, tires were all like new, the body was in great shape and that he would buy it if he were in the market. 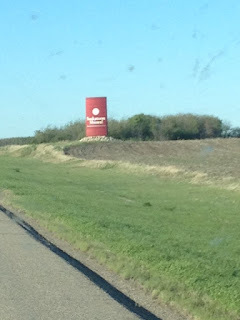 Friday morning, after driving to Sylvan Lake, we pulled in and immediately noticed that the front tires were almost bald. After checking the dates on the tires, we learned they were original (2005), knowing as we do that tires have an expiry date that was very concerning. There was some body damage at the rear we had not been advised of, and the ladder to the roof looked like a farmer had fixed them. We did a thorough go over anyway, and then went for breakfast at a local Humpty's to discuss it, as we had planned. We both decided right away that no, that was not going to be the one. But now what? 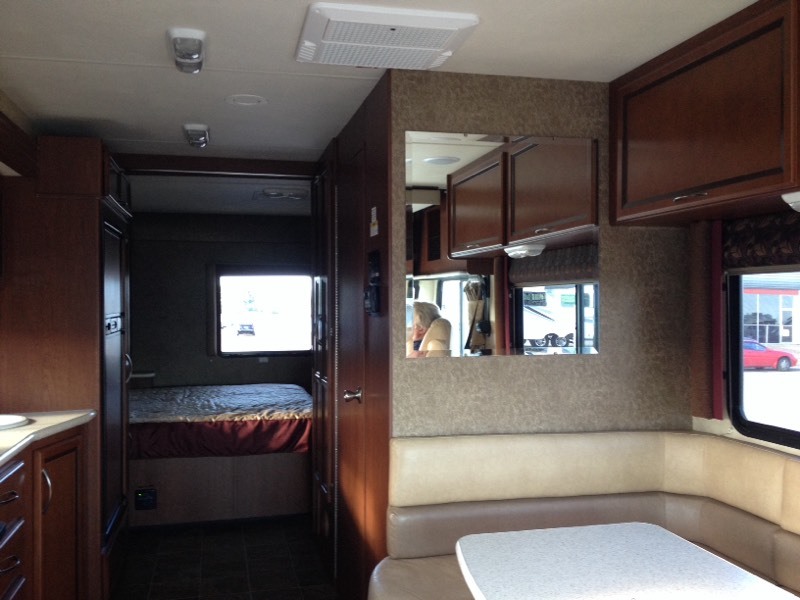 Well, my pick of the lot was a 2005 Southwind 32VS, it had solar and was 32 ft long with a couch. Brad chose a 2013 Thor Ace the price difference was significant so after much ado we decided to go for lunch and discuss it. Brad made the point that we weren't travelling to sit on the couch and watch TV which I thought was a very good point, but I was also concerned about our parents being able to get into the hydrolic cab over bed should they come to visit. However, we both agreed that they won't be coming often we don't expect, they are all agile enough to get up there, and the dinette booth could sleep one person easily anyway should that change later on. I didn't think it would happen when we left the dealership for lunch, but Brad was right and I agreed to get the much more expensive 2013 Thor. Of course, this meant financing as we had only arranged so much available cashflow when we left home, not expecting to go all out. Returning to the dealership we spoke to Blair again about our decision and he sent us to the Finance department to do the deed. Tammy Chapman was also a dream to work with. They knew we were trying to get to a family event in Saskatoon for Saturday night and she worked diligently to get the deal finalized. She confirmed with our insurance back home what time they were closing so she knew how much time she had to get us on the road Friday night. 8pm Alberta time, they told her. The deal was finalized around 7pm Alberta time so she rang the insurance to get that done. Nobody home. She spoke to someone at the Head office in Ontario who advised that our home office would be open Saturday at 8am., they did not have anybody else available before then that was licensed in our area. With no other choice, we spent our first night in Ace in the Woody's parking lot because we couldn't put her on the street without insurance, they provided us with power and we went to sleep. Tired and fed up, but clearly still Cute! After a great night of sleep, Saturday morning we got up, beautified and waited for the dealership to open. We had a short wait while the dealership did their morning ra-ra session and then Blair drove us to Enterprise to return the rental car. We had contacted the Calgary airport location and advised that we would be dropping the car in Red Deer, the lady there later called us back and said they would be dropping the 'drop fee' ($100) they usually charge for dropping off at a different location. As you might expect, Tammy called Blair as soon as the car was returned to say that the insurance company was not open Saturdays after all. In a bid to save our family get-together, Blair then drove us to a 'OneStop' which provides insurance, but because of our domicile they couldn't help either. What a gong show this whole situation became, but through it all the dealership (Tammy and Blair) were determined to get us to Saskatoon. Tammy actually remembered an insurance company (Johnson.ca) that was tied in with one of our banks, that was also based in our domicile so she contacted them as a last resort. Without that we would still be sitting in Woody's RV parking lot waiting for them to open this morning so we could finalize the insurance allowing us to leave. We spoke to a gentleman there who's name I can't recall but have written somewhere and can't find, who quickly got us insured so that we could drive to Saskatchewan Saturday in time for our family shindig. When I come across his name I will add it in this blog. 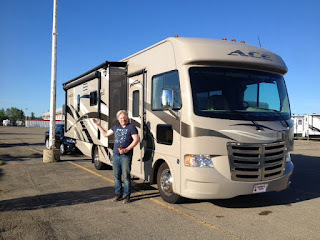 If you are ever in the RV market, we definitely and with glowing recommendation would send you to Blair Seens and Tammy Chapman at Red Deer Woody's RV World in Alberta!!! Quite the adventure, as is our way. We arrived at 7:30pm while the party was in full swing. 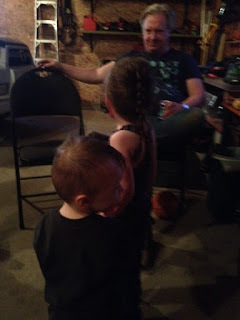 It was so nice to see the Kids and Grandkids and my Sister-in-law who by the time we arrived was completely a mess (not a big drinker this woman, so...) a good time was had by all, even though we were thoroughly exhausted by this time. Unfortunately our oldest Granddaughter was not able to be at the party and she was missed for sure, such a cutie, I call her 'mini me' as she looks just like me at that age. We have now at the time of this writing had 3 great sleeps in this rig and are thoroughly enjoying it. We went shopping yesterday for pots, dishes, camp chairs, bbq, etc that we will need just to get home, Brad waited in the car while I hit up Wallyworld and loaded my sister-in-law's car to the hilt. He didn't bat a lash which is highly unusual, normal he gets to twitching when I spend money but he's been very relaxed the last couple of weeks. Nice to see. Currently we are staying at my brother's place waiting for Brad's Mother who returns tonight from her own adventure and after visiting with her tomorrow, we expect to be on the road likely Wednesday morning. Unfortunately because we are not plated and only running on an 'in transit' permit we are not able to cut through the USA which would have allowed us to stop at my Father's for a short visit. 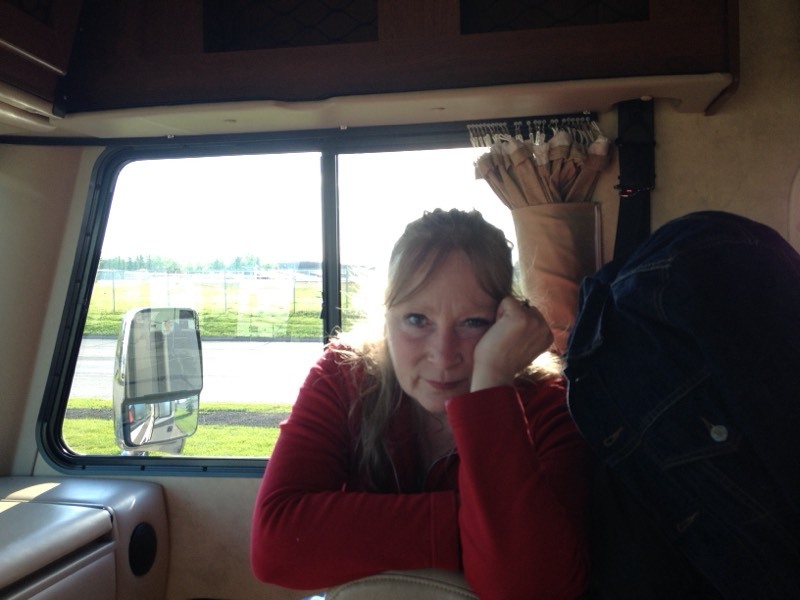 We have to drive right across Canada and I don't think the necessary backtrack is viable but hopefully the house will sell in short order and we will back across very soon. I will be checking though to see just how much of a backtrack it would be. So today is more shopping as we want to replace the 2 front tires and we need a proper comforter as the 'RV comforter is paper thin and the quilt I brought is too small as I wasn't expecting to get a King size bed! As Wilma Flintstone would say, "CHAAAARRRRGGGGGEEEE IIITTTT". 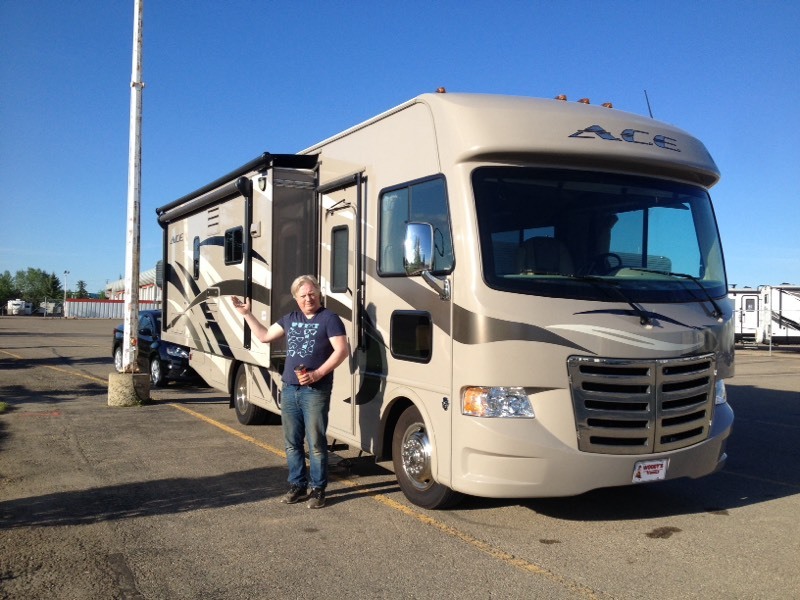 Congrats on your motorhome, enjoy, enjoy and ENJOY!!!!! !